Apropos of nothing, Lamborghini has returned Minardi M191B chassis #003 to vintage racing duties after a lengthy seven-month restoration by the company’s Polo Storico division. Many of the original 1990s Lamborghini and Minardi staff were involved in the restoration. Polo Storico is dedicated to the preservation and restoration of Lamborghini’s history, and its short-lived Formula One efforts are certainly under that umbrella. From 1989 to 1993, Lamborghini served as an engine supplier to such teams as Larrousse F1, Team Lotus, Equipe Ligier, and Minardi, as well as chassis constructor for Modena Team SpA. The 3.5-liter V12 engine provided motivation for a whopping 109 retirements and a single podium for Aguri Suzuki. It’s safe to say this engine was not destined for great things. This particular Minardi variety was pressed into service for the first four races of the 1992 season. 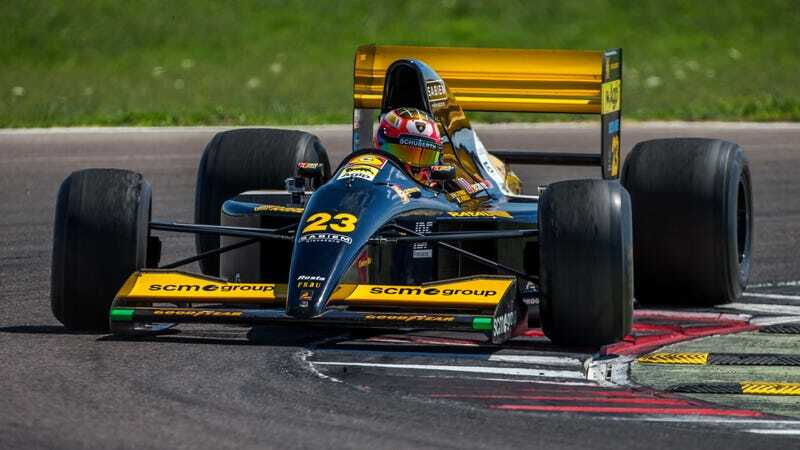 Largely a carry-over chassis from Minardi’s Ferrari-powered 1991 car, the 191B was adapted to the new Chyrsler-Lamborghini V12 and raced until the 192 chassis was ready. Driven by Christian Fittipaldi and Gianni Morbidelli, the team saw six retirements in those first four races. Morbidelli finished seventh in the third round Brazilian Grand Prix, and Fittipaldi managed an 11th place finish in the fourth round Spanish Grand Prix. Because F1 points only paid out to the top six finishers, neither effort was good for any FIA points. Giancarlo Minardi was on hand for the car’s unveiling, and as the founder of the Faenza, Italy team (which lives on as Scuderia Toro Ross today) he was quite emotional at the sight of one of his former team cars being perfectly restored. Lamborghini driver Mirko Bortolotti put the car through its paces, giving the 700-horsepower open-wheeler a 20-lap shakedown. Without any electronic aids, and using a manually-shifted gearbox, the Minardi-Lamborghini was likely a bit different to what Mirko usually drives. It may not have been successful in F1, breaking down more than it finished, but it’s a shape that brings back memories and a sound that remains inspirational today. Sure, it’s been more than a couple decades since this chassis last raced in anger, but it looks and sounds better than the cars currently in use today, if you ask me. If the FIA wants to make F1 interesting again, they’ll just have each current team on the grid restore a car from 25 years ago to race. That sounds more fun than whatever engine rules they’re going to institute in 2021.